The Chess Drum on Radio France International! On Tuesday, December 16th, Jan van der Made of Radio France International (RFI) interviewed me about The Chess Drum. We spoke about 20-25 minutes on a number of topics including The Chess Drum's inception, chess activity in Africa in the Diaspora, notable players, the impact of computer chess and hope for the chess in Africa. The interview on RFI lasts about 3½ minutes and can be found on the English service section. Real Player media is required to listen. 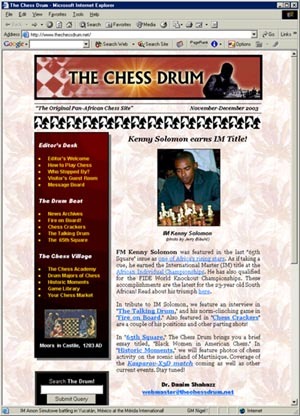 Bear in mind that while I do not consider myself the "spokesperson" for African chess, I do realize that The Chess Drum has a value that far exceeds my role as its creator. It is my hope that I have represented the African Diaspora in a positive light. KEEP THE BEAT GOING! !